Earlier this year Wilson Adams Cigar Company announced its third line called Mr. Wilson. The Mr. Wilson marks a few firsts for the company. First up, it is the first Wilson Adams cigar to incorporate a San Andres Mexican wrapper. Secondly, the cigar currently only available in a Torpedo – the first time Wilson Adams has released a vitola in that shape. 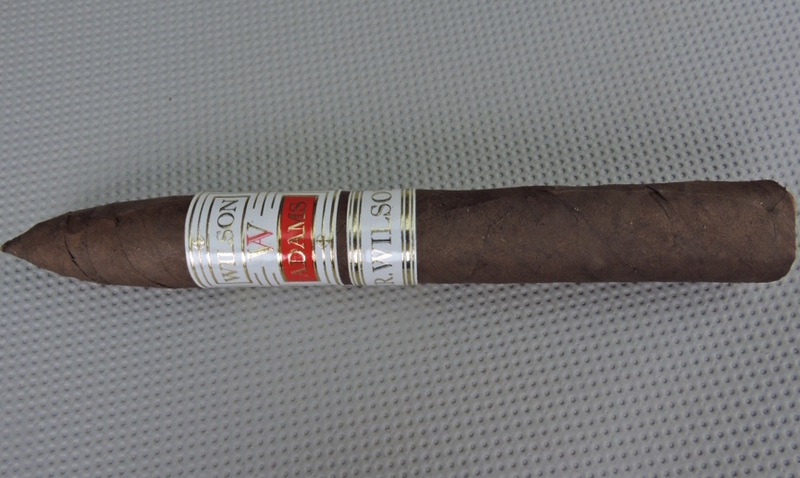 Finally, this also is the company’s first limited edition cigar. The plans going forward are Mr. Wilson to be released each year to consumers. Recently, I’ve had a chance to smoke the 2015 release of the Mr. Wilson. Overall, I found this to be an enjoyable smoke and one that continues an impressive track record for Wilson Adams. Wilson Adams is run by Brandon K. Wilson. The company is based out of California and was launched in 2012. The company has two regular production lines – Wilson Adams Habano (White Label) and Wilson Adams Sumatra (Red Label). For his blends, Wilson has partnered with the Placencia factory in Esteli, Nicaragua. Mr. Wilson is a small batch production of only 2,500 cigars. It has been distributed to sixteen retailers. 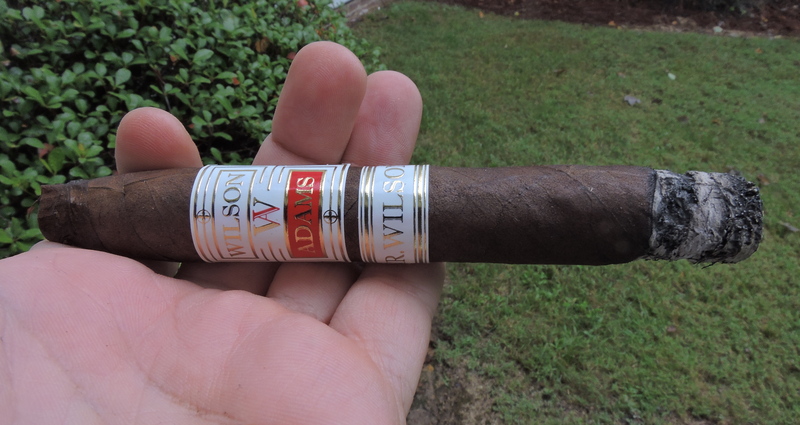 Without further ado, let’s break down Wilson Adams Mr. Wilson and see what this cigar brings to the table. The blend of Mr. Wilson is highlighted by its San Andres wrapper “primarily Nicaraguan” filler. The binder has not been disclosed. As mentioned, the Wilson Adams Mr. Wilson is available in one size – a 6 1/8 x 52 Torpedo. There is a total production of 2,500 cigars. These will split between 150 ten count boxes and 100 ten count bundles. The Wilson Adams Mr. Wilson’s San Andres wrapper has a coffee bean color to it. Upon closer examination, there is some darker marbling on the surface. The wrapper has a silky look to it and there is a very light oil sheen on it. There are also some thin visible veins. Most of the wrapper seams are quite thin and well hidden. The torpedo tip is sharply tapered. The Wilson Adams Mr Wilson has two bands. The primary band is similar to the one found on the Wilson Adams White Label. It has a mostly white background with gold font. On the band is the text “WILSON” with a “gold and red W” just below it. Sitting on the white background is a red rectangle with the text “ADAMS” in gold font. The remainder of the band has several gold adornments. The secondary band rests just below the primary band on the cigar. It is white in color with gold pin-striping. The text “MR. WILSON” appears on that band in gold font. Prior to lighting up Mr. Wilson, I went with my usual selection of a straight cut. I opted to use my Credo Special T cutter with the 36 ring gauge hole to get an ideal cut for this torpedo. After I clipped the tip, I moved on to the pre-light draw. The cold draw delivered notes of cocoa, earth, and a some cherry sweetness. Overall I considered this to be a very good pre-light draw. At this point I was ready to light up Mr. Wilson and see what the smoking experience would have in store. The start to the Mr. Wilson produced notes of cocoa, mixed fruit sweetness, earth, and cedar spice. The cocoa and the fruit notes moved into the forefront early on while the earth and cedar spice were secondary notes. The cedar notes were also prominent on the retro-hale. During the first third, I found the mixed fruit sweetness emerged as the primary note. From time to time the cocoa notes made their way into the forefront. The cedar notes were still secondary and had a slight lingering effect on the after-draw. The earth notes were also secondary notes. When the Mr. Wilson moved into the second third, I found the cocoa had moved into the forefront. The fruit notes made their way into the forefront from time to time, but by the end of this segment, these were secondary notes with the cedar. Later in the second third, I found the retro-hale took on more of a peppery varietal. During the last third, I found the cocoa notes were still primary. The cedar spice increased somewhat, but didn’t become overpowering. Most of the sweetness from the fruit was now subtle. I could still pick up some earthy notes in the background as well. This is the way the flavor profile came to a close. The resulting nub was excellent – firm to the touch and cool in temperature. Overall I found Mr. Wilson to be a cigar with excellent construction and this was reflected on both the burn and draw attributes. The burn path remained straight from start to finish. For the most part, I also found the actual burn line to be straight and one that required only occasional touch-ups. The resulting had a salt and pepper color to it (while it is darker in this photo, I have seen it lighter on some of the other samples smoked too). The ash itself was not overly firm, but it wasn’t a loose or flaky ash. The burn rate and burn temperature were both ideal. The draw was stellar. It had a touch of resistance which is something that I like. The tapered tip never got overly soft during the smoking experience. There was also a nice amount of smoke production throughout the smoking experience. In terms of strength and body, I found Mr. Wilson to be a little more dialed back than advertised. However, everyone’s palate is different and the same cigar can affect one individual differently than others. From a strength perspective, I assessed Mr. Wilson to be a medium strength cigar. There was a slight kick in the last third and the strength increased to medium to full. Meanwhile as for the body I assessed the Mr. Wilson as being on the upper end of medium to full-bodied, falling a little short of full-bodied in my book. When it came to strength versus body, I gave the edge to the body throughout the smoking experience. This was an impressive cigar by Wilson Adams. One thing that impressed me right out of the gate is how well this blend performed in a torpedo format. While normally I don’t gravitate to a torpedo, the planets seemed aligned with the torpedo size for this particular blend. This should also be a cigar that satisfies the San Andres wrapper fans. While I’ve been critical of the San Andres wrapper because I find it can overpower a blend, this was not the case with the Mr. Wilson. This is a cigar I’d recommend to an experienced cigar enthusiast, but it’s one I wouldn’t discourage a novice from trying. As for myself, this is a cigar I would smoke again. It’s a cigar that I think has even more upside with aging. It’s easily a cigar worthy of a box split. I need to try these…I’ve been hearing good things! Nice review Coop. I was more impressed with this cigar. Currently my #2 or 3 cigar for 2015, behind the LAT La Mission and possibly behind the Roma Craft Neanderthal (or ahead of it).